Discover interesting facts and information about the weapons, including the Muskets and Rifles, used by Native American Indian tribes. Springfield rifles took their name from the Springfield Armory, established at Springfield, Massachusetts in 1794. Smoothbore muzzle-loading rifles were produced between 1858 and 1865 followed by single-shot rifles and eventually the Springfield repeating rifle. The 1840 Springfield rifle was one of the most innovational flintlock muskets for its times, having a 42’’ barrel and firing a 69 caliber cartridge. The 1861 Springfield rifle musket had a long barrel of 40 inches, fired a 58 caliber and weighed almost 9 pounds. In 1898, Erskine Allin, the Superintendent of the Springfield Arsenal, developed the M1903 Springfield Rifle an American clip-loaded, 5-shot, bolt-action service rifle that was introduced in 1903 . 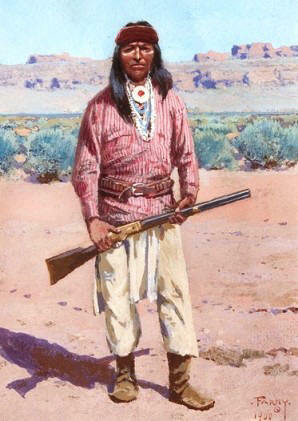 Native American Weapons - Muskets and Rifles. 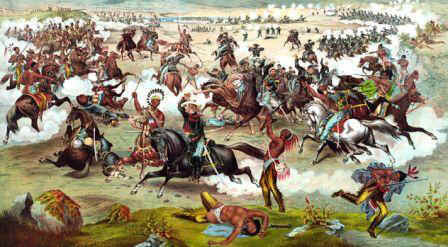 Discover the interesting facts and information which relate to the History of Native Americans and the weapons they used such as Muskets and Rifles. The pictures on this site show the weapons and tools that were used by various Native Indian tribes that can be used as a really useful educational history resource for kids and children of all ages. All of the articles and pages can be accessed via the Native Indian Tribes Index - a great educational resource for kids providing an unusual insight into their culture. We hope you enjoy watching the videos - just click and play - a great resource for gaining facts and information about the life of Native American Indians.